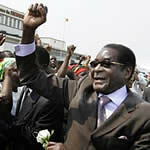 President Mugabe of Zimbabwe attended the African Union Peace and Security Council meeting held on March 10, 2011. Zimbabwe is launching a nationwide anti-sanctions campaign in this Southern African nation., a photo by Pan-African News Wire File Photos on Flickr. About 45 community trusts together with 75 employee and 35 management share ownership schemes are set to be unveiled this year while industry’s capacity utilisation is expected to rise to about 80 percent creating jobs for hundreds of thousands of people in 2012, it has been revealed. The community trusts together with the share ownership schemes will be rolled out in all districts this year as the Government’s indigenisation and economic empowerment programme gathers momentum. Moves are also afoot to set up a special facility for all civil servants. The broad initiative is specifically tailored to empower hard-pressed indigenous people, most of whom are failing to secure employment owing to a sanctions-induced economic downturn that has seen the job market failing to absorb additional manpower. Last year, communities drew closer to economic empowerment following the launch of Community Share Ownership Schemes. The year 2012 marks the expansion of this programme to cover all districts in the country. In an interview last week, the acting director for indigenisation in the Ministry of Youth Development, Indigenisation and Empowerment, Mr Tingaitei Fungati, said 45 community trusts, 75 employee and 35 management share ownership schemes would be rolled out this year. He said his department was finalising the modalities of the ventures. He said the scope of the beneficiation would hinge on the capitalisation of the National Indigenisation and Economic Empowerment Fund (NIEEF) and the schemes. NIEEF will provide financial assistance to indigenous Zimbabweans to finance share acquisitions and other empowerment purposes, he added. “We are expecting a very bright year in terms of indigenisation in 2012. The share ownership schemes will be taken to all the country’s districts. “A minimum of 45 community trusts, 75 employee and 35 management share ownership schemes are set to be unveiled this year. Mr Fungati said Government was still negotiating with the banking sector to unlock funding. “We made a lot of headway last year after setting up a capital access window through Old Mutual. He said Government was also planning to introduce special empowerment programmes for civil servants. “We are currently looking at how we can set up empowerment programmes specifically designed for civil servants. Industry and Commerce Minister Professor Welshman Ncube said the implementation of the Indigenisation and Economic Empowerment Act would help resuscitate industry. “The indigenisation thrust raises positive prospects in that an increase in equity gives scope for an increase in growth,” he said. “The empowerment of the people is necessary as it enhances economic freedom. It is, therefore, my hope that as we grow investment thresholds we also grow industries. Prof Ncube said Government intends to increase industry’s capacity utilisation to 80 percent. He said industry also expected Finance Minister Mr Tendai Biti to avail funds under the Special Drawing Rights (SDRs). “We should reach a figure of 80 percent in terms of capacity utilisation by the end of the year. This will be one of the highest. Economist Mr Christopher Takura Mugaga said Government should move swiftly to implement the Indigenisation and Economic Empowerment Act. “In 2012, we need to close the gap between implementation and speculation,” he said. "The Act should be implemented expeditiously because any speculation, hesitation or delay has the effect of destabilising the economy." Mr Mugaga said the implementation of the law would help create more employment opportunities. "The implementation of the Act means a significant improvement in employment creation. "A lot of people in the informal sector will be able to formalise their businesses and those that are skilled, but unemployed, will get an opportunity to utilise their capabilities." In terms of the law, major companies are supposed to cede 10 percent of their shareholding to communities in which they operate under community share ownership schemes. The schemes are administered by community leaders. They finance education, health and income-generating projects, among other initiatives. Under the employee share ownership scheme, companies are required to set aside a minimum of 5 percent and maximum of 28 percent of their equity for workers. Zimplats, Unki Mine, Schweppes and Meikles are some of the companies that have launched share ownership schemes.